Wearing: Athleta pants, Sweaty Betty legwarmers, Sweaty Betty headband. Over on the Yoga Forum we've been discussing what we do for work and how that affects our bodies, and a number of the members sit all day long, so I decided to see if I could create something to help. This is for my desk dwelling people - the ones with achey backs and tight hips. The ones to sit all day long. Does that sound like you? If so, schedule some time into you day and take five minutes (or longer, you deserve it! ), for a little yoga break. No, really. Do it now. Set a reoccurring alarm every afternoon and see if this alleviates your pain. Bonus points if you work in a cubical setting and are brave enough to lay on the floor. Actually, if anyone does this in that scenario, tweet me a photo or send it on Facebook. I might even send the first person to do this a prize. I'm not even kidding. 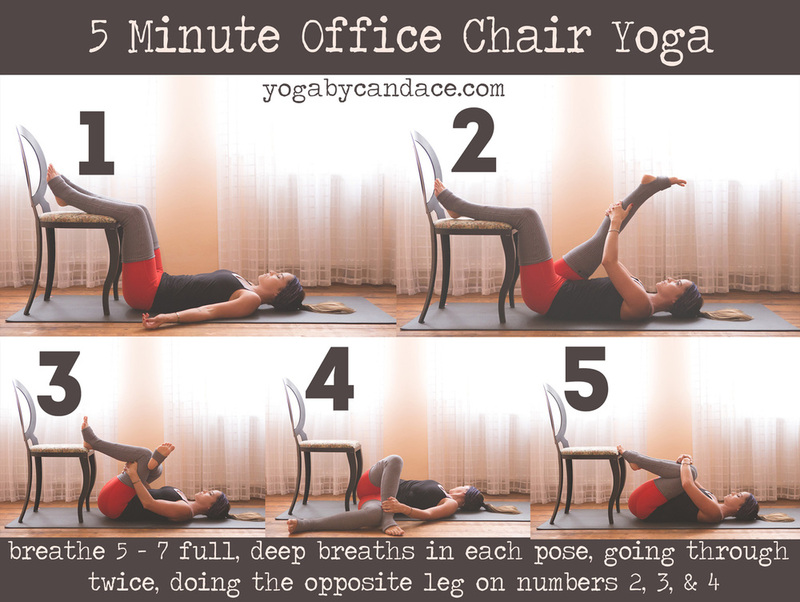 So this sequence is a restorative, gentle yoga sequence that is perfect for any time of the work day (or even after work using a couch in lieu of a chair). There shouldn't be too much effort involved. Rather, let your whole body be very heavy, and let the breath comb through the tight muscles. My absolute favorite stretch in this sequence is number four, an awesome IT Band move. It's a little tricky to get, though, so lemme break it down for you. Start with pose number three and keep your legs exactly in that position. Then, bring the legs to the left, planting your foot solidly into the floor. Keeping the foot on the floor, pull the shin in towards your body, and energetically push the knee away from the body. You should feel an amazing stretch across the IT band. Ok, now get to it! Happy practicing. Let's talk What jobs have you had in the past and how, if at all, did they impact how you physically felt?